Situated at the Rixos Premium Dubai on JBR, this authentic Italian eatery is a must-visit for food fanatics looking for a taste of Italian cuisine right here in the Middle East. 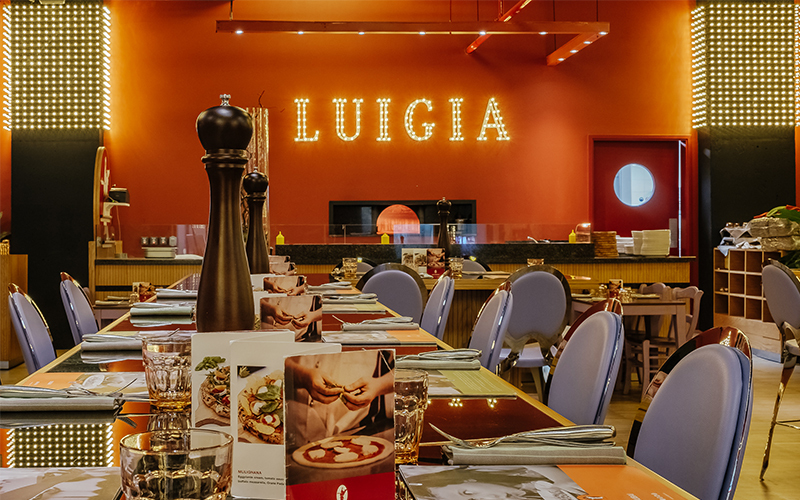 The opening of the Dubai branch in January 2018 marked the fifth Luigia opening in the chain, which was founded by Luigi Guarnaccia and Enrico Coppola – with the remaining four outlets situated in Switzerland. The rich red walls and dazzling lights in the JBR branch give the restaurant a cabaret feel, while still oozing a high level of class throughout the spacious dining area. Priding itself on serving “the best of Italy” – a phrase that is also donned in tiny lights on the restaurant wall, Luigia’s huge specially built Neapolitan wood-fired ovens and eye-catching pizzaiolos give a real sense of authenticity, and we couldn’t wait to see if this was reflected in the food, too. I can never resist the fresh, crisp combination of tomatoes and red onion whenever I see bruschetta on the menu, so it won’t come as a surprise to hear that we began with the Bruschetta Mediterranea. Served with Datterini tomatoes, tuna belly, red onions, bread croutons and oregano, not forgetting the basil leaves to finish, this generous portion was everything I wanted from my bruschetta craving and more. The tuna flaked away delicately and was paired perfectly with the ultra-fresh Datterini tomatoes, which are naturally sweeter than their cherry counterparts. We also tried the Polpettine Napoletane; home-made veal meatballs in a rich tomato sauce, topped with Pecorino Romano DOP cheese. Deliciously warming, meatballs are one of my go-to comfort foods, and these certainly didn’t disappoint! For mains, it would’ve almost been rude to sit and watch the pizzaiolos across the restaurant hard at work without trying one of the 38 pizza choices from the menu. We opted for the Stromboli – a tomato-based pizza with roasted peppers, spicy sausage and Grana Padano. The Fior di Latte di Agerola (mozzarella, to the non-Italians out there) deserves a special mention. 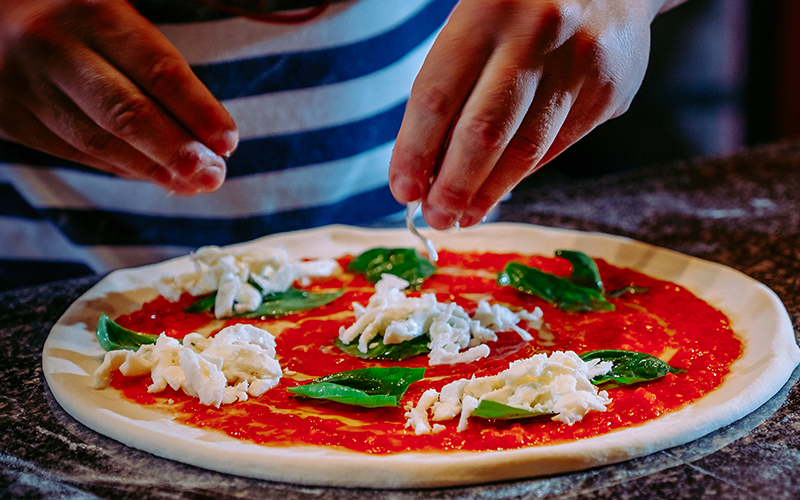 The Stromboli pizza features this traditional soft textured cheese, which is produced with whole cow’s milk in the village of Agerola, Naples. It’s firm while still tasting creamy, and stretchy without being rubbery. And as a lover of pizzas in all shapes and sizes, I can confirm that the team at Luigia really do know how to do a pizza base right; not too thin, not too thick, and crispy in all the right places. We chose the Eivissa salad to accompany our pizza, which included avocado, Alalunga tuna, black olives and the return of our favourite Datterini tomatoes. Though I didn’t dislike the salad, I certainly wish we’d opted for a carb-loaded bowl of fresh pasta instead! If you’re planning to visit Luigia anytime soon, my tip would be to go hungry because there are some delicious looking mains that I’ll certainly be back to try before long. 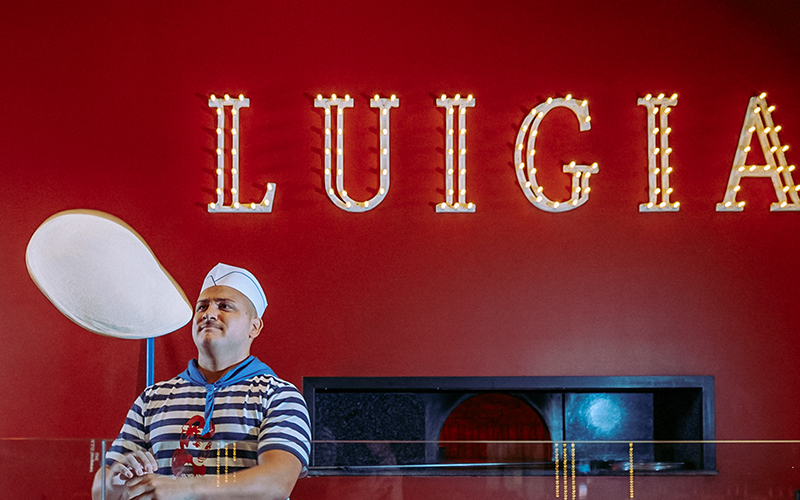 For those looking for a true taste of Italy here in Dubai, I would certainly recommend Luigia. There are plenty of offers to take advantage of, including the ‘Pop and Pizza’ night every Wednesday, where you can enjoy your favourite pizza with three beverages for AED 150. The weekend brunch also looks like a fun outing for families, as the kids eat for free and are kept entertained while the adults enjoy a selection of Luigia’s favourite dishes from AED 190 per person. Details: Priced at around AED 250 per person for three-courses, without beverages. To make a booking, call 04 349 6950 or visit the website.